So… this is one of those projects around the house that got dragged on and on. Craig shiplapped a wall of this room and painted the rest like a year ago. Yikes! Somehow, life just passed by us so fast and every time I went to design it, something just didn’t feel right. It didn’t look right. With the white shiplap wall and our white table… the entire room just looked like a huge white blob in camera. Even though I’ve always wanted a farmhouse table, I didn’t want to invest in a new table until our youngest was a couple of years older. But, few weeks ago, I just couldn’t do it anymore. The table I wanted was thousands of dollars, and because ain’t nobody got money for that, I asked my amazingly talented hubby to build me one instead. :) At the fraction of the cost, but a lot of my hub’s labor, viola! This table gave our space some color contrast! What a difference it made! I was now ready to get the design part done. If you know us, we work very well under pressure… We have to have some ‘stress’ in order to get things done! Our goal was to get this area finished by Thanksgiving, and we did it! One night after the kids went off to sleep, Craig said, “C’mon! Let’s go to target and get some frames!” Now, ladies… I know… I’m one lucky gal to have a man who will initiate in going to Target with me. :) We both HATE shopping unless there’s a mission and we definitely had one mind! We walked straight into the frames aisle, grabbed a few decor items and boom baby! We were done! Craig hung everything that night. We ordered the photos from our family portraits and off to sleep we went. (Oh yeah, and don’t worry… my mom was home with the kids when we went to target. LOL) The next day, we went shopping for chairs. We bought 3 different kinds to try at the table and oy, I didn’t like any of them. :( I initially wanted wooden chairs, but all the colors of the chairs were clashing with the color of the table which I expected because the table’s color is very unique. As I walked away from the table, I just saw a clear vision in mind of the space with black chairs. For me, it always has to work in my head first, and it did! It was perfect! So, back out we went to get black chairs and it turned out that these black metal ones with wooden seats were PERFECT! This type of chair was NOT what I first planned on at all, but hey, sometimes plans that don’t work out is better for us. Those chairs… we found them from a store, but when we looked it up on Amazon, it was literally HALF the price AND we could get 4 more! What the what?! And by the way, it was our first ever purchase of anything that Joanna Gaines made, so I feel very happy to have a piece of her in our home now. hehe And oh! 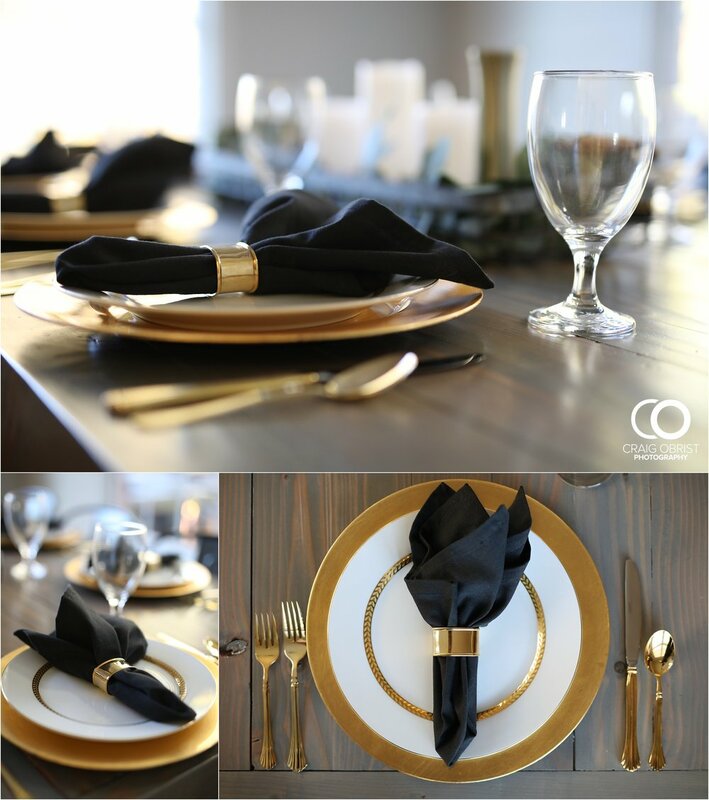 Those dishes… I originally planned on getting new dishes, but because we had touches of gold in the decor, our gold dishes worked perfectly! These were given to us by our amazing friend, Marie, a few years ago. I was so happy when it went well with everything and our wallet thanked us too. Look at the before and after pics below! What a difference, right? I just can’t believe it… So, one of the perks of your hubs building a table for you is that you can get a customized measurement that will fit perfectly in your space. So, here’s a little story about that white table. When we first moved into this house, we had an even smaller glass table which was a hand me down from my mom. Not too long after we moved in, our daughter’s friend came over and broke it! Crazy, I know… Thank God no one got hurt. Especially back then, our kids were very small which means a ton of mess, so I did not want to get a new table then either. So, I went on Craig’s list (the best list around lol!) and found this Crate and Barrel set for $350. We went the next day and negotiated for $300. hehe We used this thing UP for five years ya’ll! We definitely got our money’s worth and made TONS of memories here…. But, we had to say goodbye for another set of memories on our new table. It feels so special because Craig made it. But, the purpose of sharing any of our decor are pictures! Yes! What’s a room without pictures? What’s the point of decor without pictures? To us, photographs are the essence of home decor. Because we just took our family portraits, it was perfect timing in printing these out. It was so hard to choose just a few, but here is our collage! I love the look of these thin frames… Everything on this wall is from Target except for the shelf. That’s from Ikea and the framed verse is from “at home”. 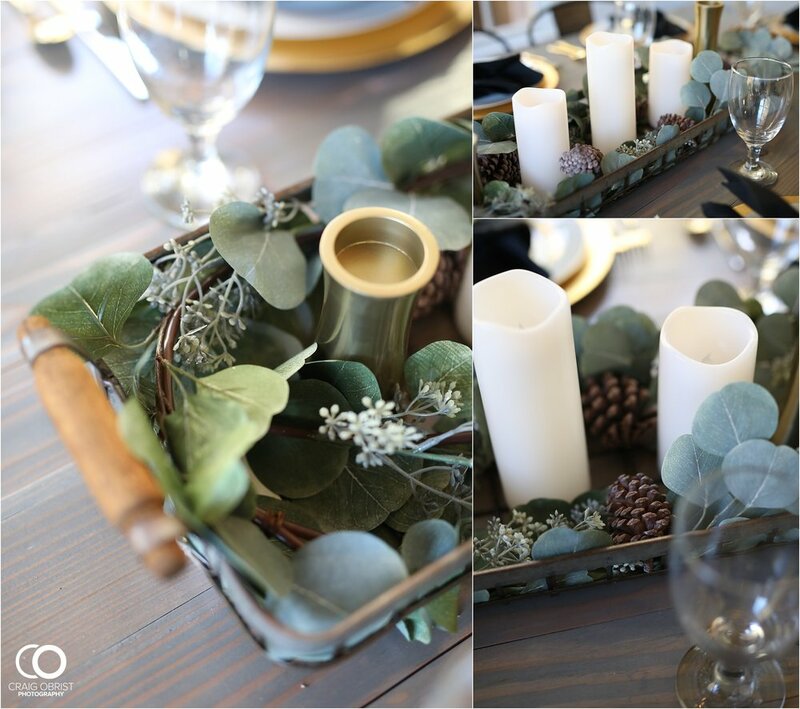 The center piece is from hobby lobby, the candles are from “at home”, the gold pillars are from Target as well as the garland inside the center piece (Joanna Gaines’s Magnolia collection). Love these wooden framed mirror from Target! Those wreathes are all year round wreathes, so they were keepers! I barely do any seasonal decorating, so I loved it… AND! Yes… it’s another piece of Joanna Gaines. :) Welcome to our home, Chip and Joanna! Made a little “sister’s corner” for our girls… Yes, they fight and fight and fight and do what sisters do, but they sure do love each other and can’t live without each other. Love the way Craig captured these two in these photos! Ah! I can stare at these photos all day… Guys, it’s the most heart breaking thing for us as photographers when you don’t print your photos or you print them through places that don’t have the quality. The galleries we send you are online stores to order your paper prints like these, so click the “buy” button. Order now to get them by Christmas! Did your gallery expire? Just contact me and I’ll get you all set up! When we have friends over, this is the spot that they stay in the most of the time, so we are so happy to have invested time and money into this space. We pray that everyone who will be seated here to experience great fellowship, great talks, and great food. I mean, what’s a table with no good food? We have one rule for our guests. Well, actually two. Please take your shoes off and please leave our home with your bellies full. Our kids said that they feel like they’re in a magazine when they sit here. They’re so proud that their daddy made this table. I wonder if they will one day fight over who gets to have it? :) It’s very kid friendly table too because everything is very easily wipeable! How many moms like that feature? hehe Thank you all for reading and keeping up with our fun home projects. We are hoping to do our guest bathroom next because it’s nasty! LOL! It may be our kitchen cabinets. I don’t know…. whatever it will be, I’m sure you’ll hear about it. :) Thank you, friends, and we wish you all a very Happy Thanksgiving.